Donald Trump officially became the newest occupant of the White House, on the 20th of January, 2017, and as the transition period began, he met with President Obama for talks that would ensure that the transition went smoothly, even as the American people have trooped out in thousands to protest the election results. Meanwhile the president-elect’s brand new state limousine, nicknamed The Beast, is almost ready. 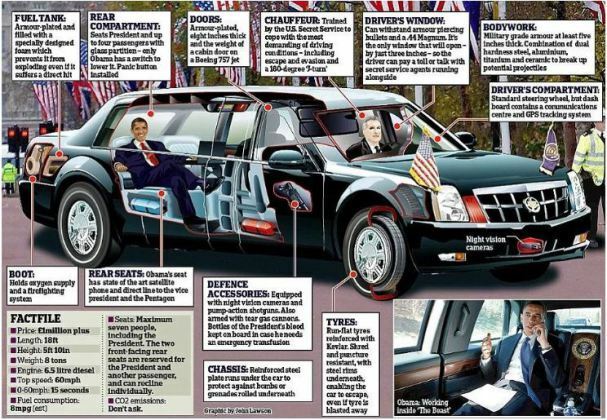 Designed from the ground up by the Secret Service, the $US1.5 million “Cadillac One,” aka “The Beast,” is a moving fortress impenetrable by bullets and bombs. 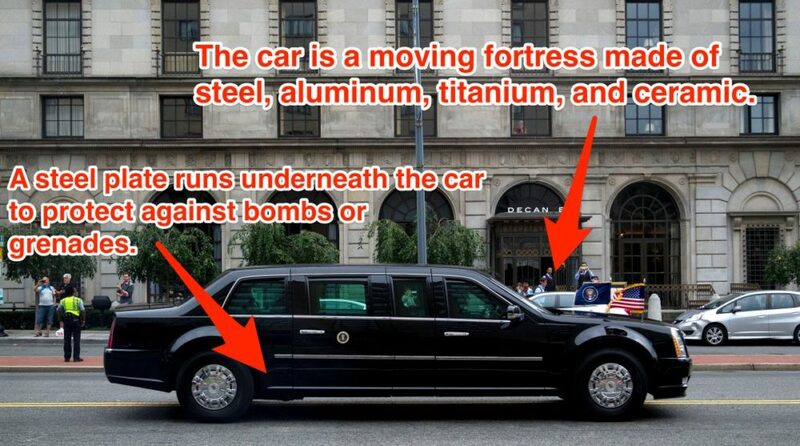 The president has 12 identical limos in rotation and, when not in use, they’re parked in the basement of the Secret Service’s headquarters and are under 24-hour surveillance, AutoWeek reports. 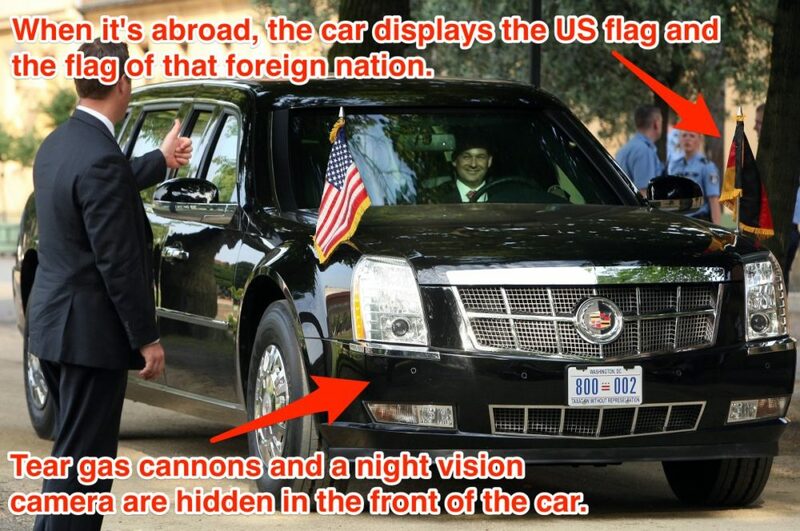 At least two cars travel with the president wherever he goes, and they get a humble 3.7 miles to the gallon. The president’s motorcade is surrounded with up to 45 other armed vehicles, including an identical decoy, local police, a mobile communications center, more armed vehicles, and an ambulance. 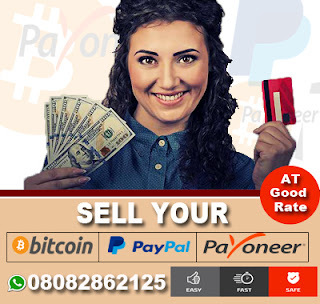 The cars are manufactured by General Motors in Detroit and have a gasoline V8 engine. 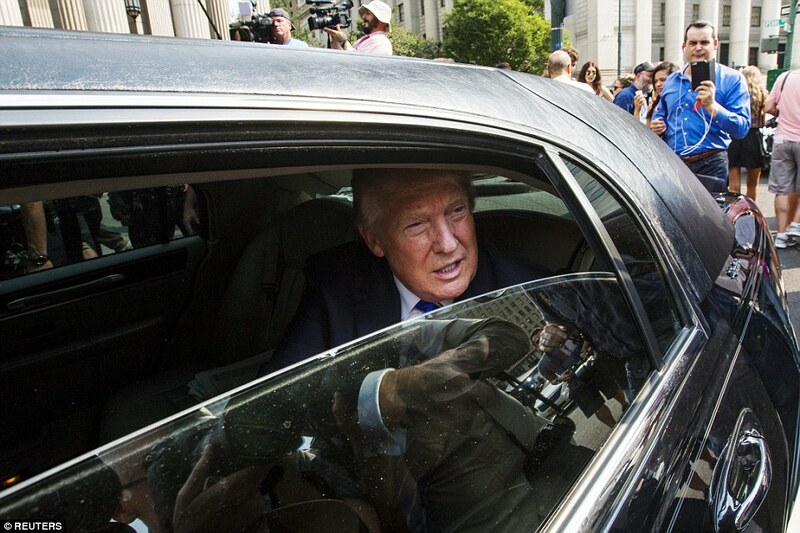 The top speed and weight of each car is classified, as is the bulletproof technology used in the windows. The car will likely have a Cadillac body strapped on to an elongated frame, much like previous models is packed with safety features to protect the new first family such as bulletproof glass and armor plating. 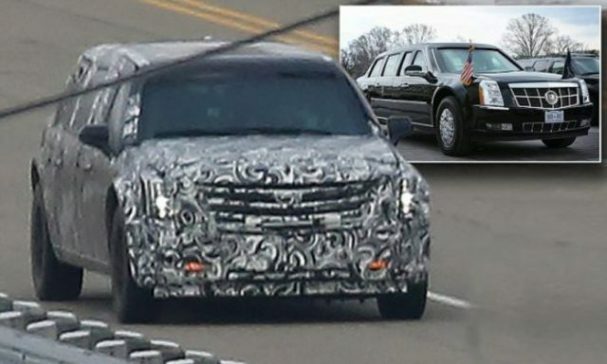 While details of the presidential limousine itself are a closely-guarded secret, pictures show it sporting the grille and headlight design from the new Cadillac models. 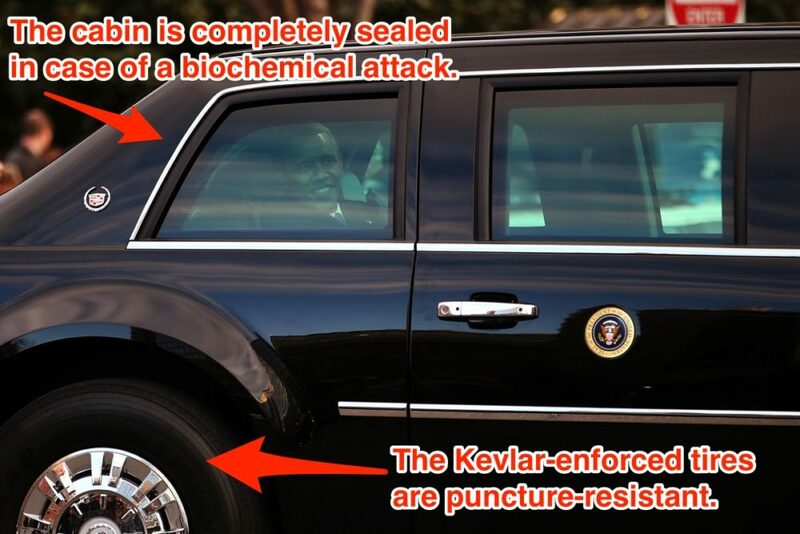 The new car will eventually be painted in the same black and silver as the current vehicle used by Obama, but currently it is covered with camouflage paint to disguise new features. But while the appearance of the car might be mundane from the outside, under the skin it is anything but ordinary. The current state car is thought to weigh eight tons due to the huge amount of armor plating built into the frame. 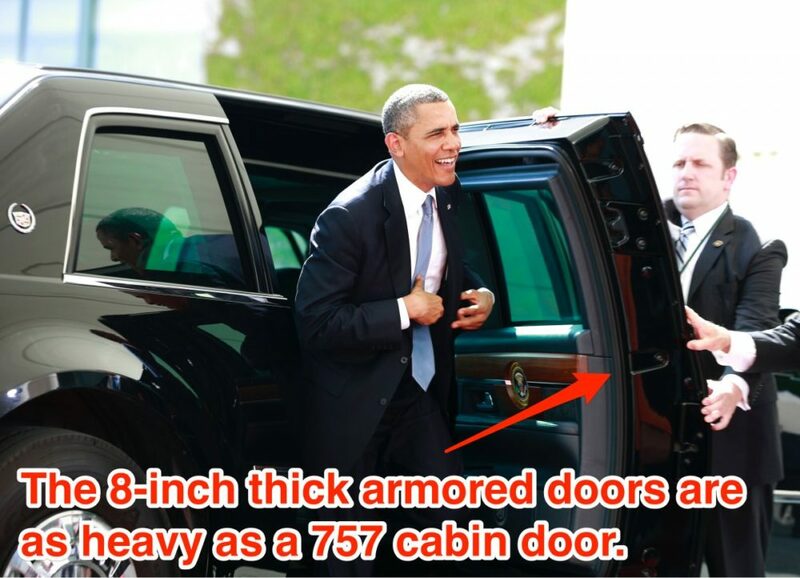 The doors are around eight inches thick, each weigh the same as the door of a Boeing 747 jet, and completely seal the cabin to protect it from a chemical or biological attack. 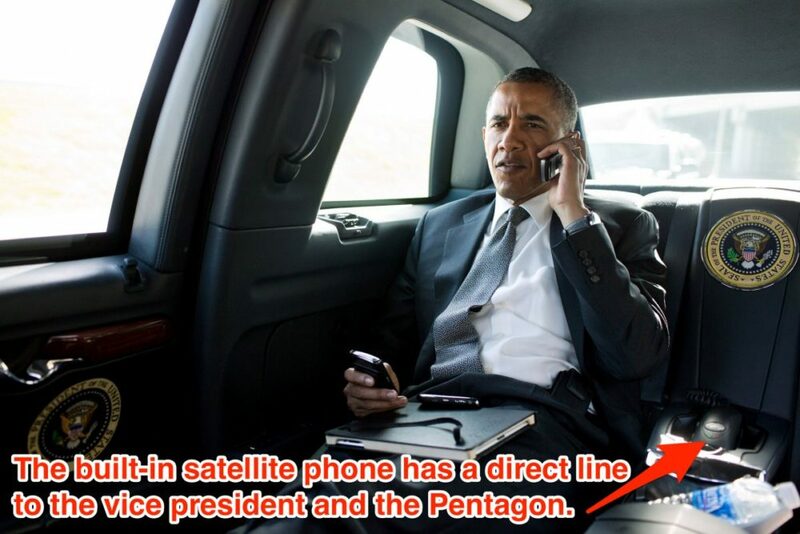 It is also reported that the White House maintains a fleet of around 12 of the cars, which are deployed around the world to protect the President, with each vehicle costing up to $1.5 million each. These are then handed to other government officials after being retired, with one usually stored in the library associated with the President who used it. 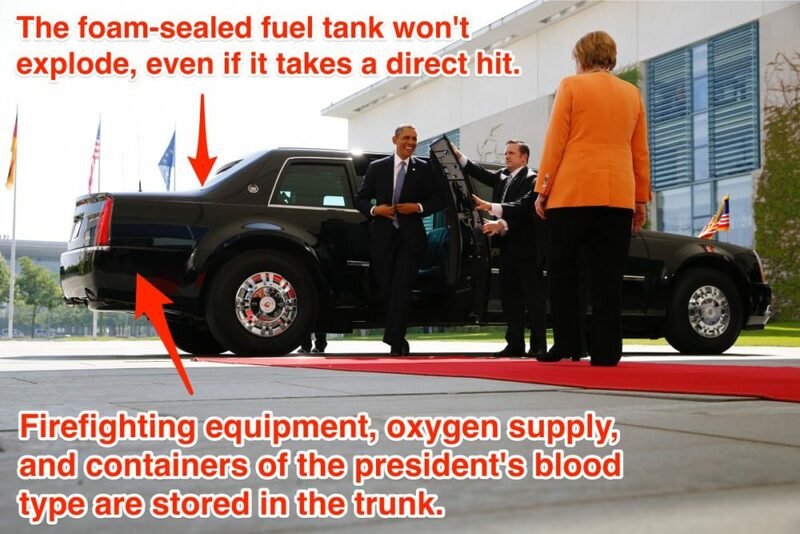 Concealed in the trunk is an oxygen supply that allows fresh air to be pumped into the cabin in the event that the air outside becomes toxic. All of the windows are completely sealed and unable to roll down, except for the driver’s side to allow him to pay tolls, and are able to withstand armor-piercing bullets and explosions. 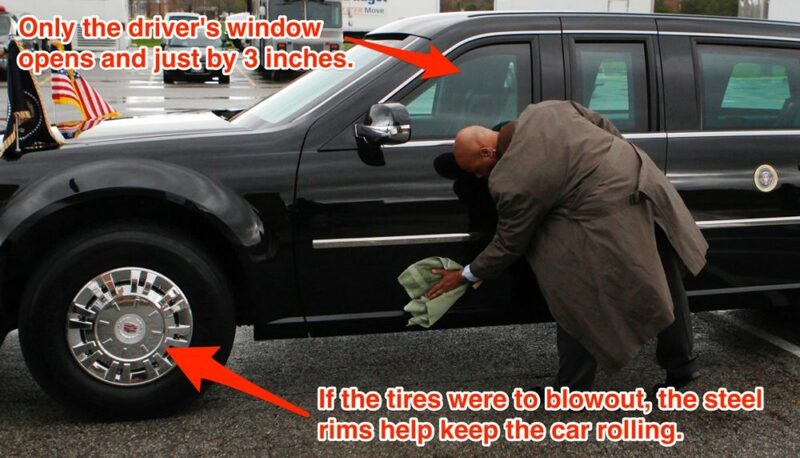 The tires are coated in Kevlar to protect them from bursting, but even if they do, the metal rims are strong enough to hold up the vehicle and keep it rolling in case the outer layer is blown away. The fuel tank is coated with armor plating and contains a special foam which expands on impact and prevents it from exploding, even if it suffers a direct hit. 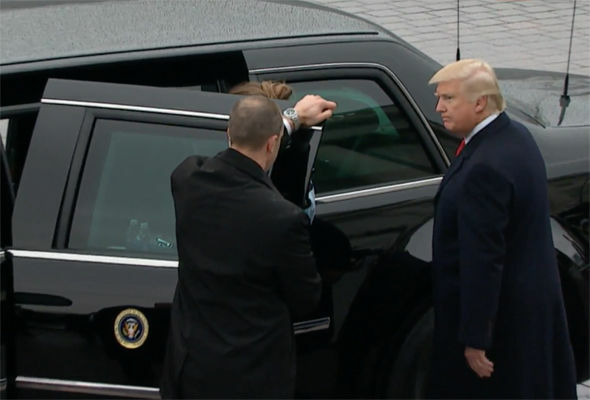 The vehicle is also fitted with night vision cameras, GPS tracking and a satellite communication system to allow it to run in any conditions and make sure the President is always in contact. There are even two pints of blood matching the President’s type on board in case an emergency transfusion needs to be carried out at the roadside. Concealed within the bodywork is a full range of firefighting equipment, shotguns, night vision goggles and even tear gas launchers to help the vehicle get out of trouble. 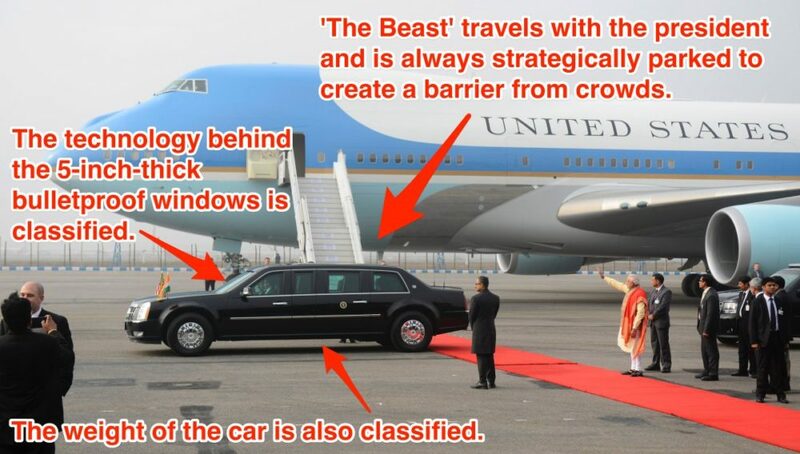 0 Response to "Top 11 Facts About Donald Trump’s Presidential Armoured Car Called The Beast!!! – He Can Never Be Killed In This (Must See Photos)"